BLACKSBURG, Va., July 17, 2009 – Students have played an integral part in planning and executing Virginia Tech's Hokie Camp, which is entering its second year. 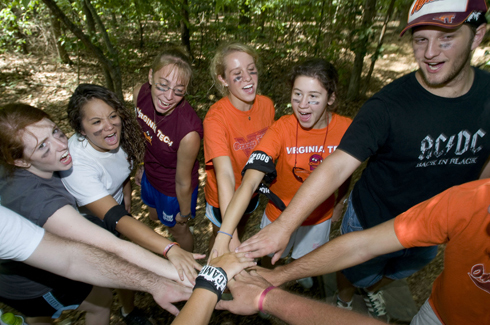 Hokie Camp is an orientation experience for freshmen held at the Smith Mountain Lake 4-H conference center prior to the start of the academic year. The three-day, two-night program is designed to be a fun way for incoming students to make new friends and learn more about life and traditions at Virginia Tech. The camp’s activities include a low ropes course, games, sessions about traditions and academics, and a bonfire. There will be three sessions of Hokie Camp this year, running Aug. 10-12, Aug. 12-14, and Aug. 17-19. While they are supported by staff members from the Office of the Dean of Students, a department within the Division of Student Affairs, and various Hokie Camp committee members from across the university, much of the planning and work comes from two student directors and five students executives who discuss scheduling, hire volunteer counselors, develop programming for camp, and put together a weekly newsletter to keep counselors informed. "Hokie Camp has two student directors who work with orientation staff to coordinate Hokie Camp,” said Rick Sparks, assistant dean of students and orientation director. “I think this allows Hokie Camp to provide incoming students with an amazing, authentic experience. Who knows students better than other students?" This year, the two student directors are Kristen Walker of Williamsburg, Va., a senior majoring in international studies and Spanish from the College of Liberal Arts and Human Sciences; and 2009 graduate, Yusuf Abugideiri of Sterling Va.
“Our main role at camp will be to help orchestrate the program behind the scenes, letting the counselors and campers shine in the spotlight, and form a strong bond that we envision will last through the remainder of both parties' careers and beyond,” said Abugideiri. The student executive board is made up of five seniors, all of whom served as counselors for the inaugural year of the camp in 2008. These students will help with training, interviewing, and hiring, and each will serve as a "super counselor" to their respective group during Hokie Camp. Members of this year’s executive board are Casey Windmuller of Glen Allen, Va., a senior majoring in communication in the College of Liberal Arts and Human Sciences; Jason Garrigan of Marietta, Ga., a senior majoring in building construction in the College of Architecture and Urban Studies; Kelly Marron of Richmond, Va., a senior majoring in marketing management in the Pamplin College of Business; Amanda Lodge of Manassas, Va., a senior majoring in management in the Pamplin College of Business; and Dean Stevenson of Springfield, Va., a senior majoring in mathematics in the College of Science. In addition, providing the camp experience to the 1,000 expected freshmen are 150 student Hokie Camp counselors, responsible for leading a group of freshmen through Hokie Camp and throughout their first year at Virginia Tech. Many of the counselors this year were campers last year.